Watch Alex Fasolo put Collingwood in front with only seconds remaining against Geelong in round eight last year. Josh Hunt concedes a 50m penalty and Fasolo makes no mistake. 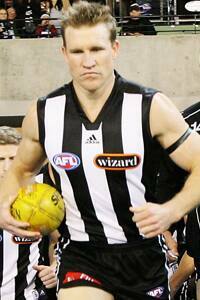 Nathan Buckley runs out onto the MCG for the 2007 Preliminary Final - his final AFL match. Collingwood and Geelong have developed a fierce rivalry during the past six seasons. Ever since the two clubs staged one of the greatest matches of all time in the 2007 Preliminary Final, the contests have been highly anticipated and rarely fail to live up to expectations. Collingwoodfc.com.au has taken a look at each of the 12 matches since that late September night and broken down the moments that matter. During that 12 match stretch, Collingwood has won five games and Geelong seven. Of the four finals, the Magpies have only won one. But what a win it was. Geelong entered the match red hot favourites but a gutsy Collingwood refused to give an inch. Despite its number one ruckman Fraser withdrawing on the eve of the match with a back injury, the Magpies hung in there all night long and were pushing deep inside 50 when the final siren sounded. After a whole summer to digest the Preliminary Final loss, Collingwood inflicted Geelong’s first defeat since round 21, 2007, and did so in convincing fashion. Collingwood kicked the first three goals of the night and set the tone for a game in which it produced an incredible 85 tackles. Lockyer, Burns and third gamer Wellingham led the way in the midfield while Rocca managed to quell Scarlett’s influence. From the moment Leigh Brown missed a set shot at goal from point blank range only five minutes into the game, Collingwood could never quite get it right against the runners up of 2008. Geelong had the Easter Thursday match under wraps for most of the night and were rarely threatened en route to a 27-point win. Riding high after pinching the Semi-Final out of the grasp of a disbelieving Adelaide, Collingwood plunged down the emotional roller coaster of finals football and out of the 2009 finals series as the Cats stormed to a 73 point win. Pre-game rain meant that the surface was greasy early on but by the time it dried out the blue and white had all the answers. Johnson and O’Brien kicked the first two goals of the night but the Magpies could manage only four more for the remainder of the game (including none in the final quarter). Having dropped both games to the Cats the year prior, Collingwood entered the match eager to make amends and looked every chance of doing so when Beams kicked two goals in the shadows of half time to trail by only five points at the main break. An O’Bree goal six minutes into the third quarter put the Magpies 10 points up and was followed by behinds to Davis, Johnson and Thomas in the space of three minutes. Incredibly, an 11-point lead evaporated and was quickly replaced by a 22-point deficit at the final change. For the second time in a row, the Magpies went goalless in the final quarter as Geelong stormed to a six goal win. There was plenty at stake for Mick Malthouse’s men. They entered the match with six consecutive wins behind them and keen to knock off Geelong for the first time in two years. After a tight first half, Johnson steadied the ship with a trademark long goal from outside 50m just as it appeared Geelong was going to put the Pies to the sword. Instead, Collingwood went on to boot another three goals to Cloke, Thomas and Beams and led by 13 points at the final break. Goals to Jolly and Beams iced the game, the Maggies home by 22 points. One of the most famous nights in Collingwood history. With the weight of expectation on their shoulders, the young Magpies sensed the occasion and seized the moment with a seven goal to one opening quarter. From Leigh Brown’s goal from 75m that bounced the ‘wrong’ way twice to Johnson’s sidestep around Ling, the quarter was a half hour highlights reel. The near-capacity crowd expected Geelong to fight back hard but was shocked when the Magpies burst out of the middle for Sidebottom to goal only 35 seconds into the second quarter. By now, the die had been cast and although the Cats managed eight of the last 10 goals it was cold comfort in Gary Ablett’s final game for Geelong. For the record, Ablett managed 40 possessions. Most presumed that Geelong would fall off the pace and the Magpies continue with their winning ways as 2011 got underway, but by round eight it was clear that the Cats weren’t going anywhere. Collingwood led by five points at three quarter time and nearly snuck over the line when Pendlebury goaled from a stoppage after Wood was infringed. Curiously, the umpire opted not to pay advantaged and forced Wood to take his kick from 60m out. The clock then ticked down into the 28th minute and sounded time on Collingwood’s first loss for the season. A game Collingwood supporters want to forget. The two teams occupied the top two spots on the ladder (the Magpies having already locked in top spot for the second successive year) but you would never have known it once the Cats got out the gate in the second quarter. After the Pies kicked the first four goals of the night, Geelong kicked 22 of the last 26 goals to win by 96 points. All of this in the season in which the Magpies were kicking big scores in their sleep. On the eve of the finals, it wasn’t a good portent of things to come. So near yet so far. When Geelong spearhead Podsiadly went down with a dislocated shoulder at one end and Krakouer floating across a pack to mark at the other to put Collingwood three goals in front midway through the second quarter, Pies fans began to believe that premiership No. 16 was on its way. Let’s leave it there. This wasn’t redemption for the losses 12 months prior, but it was still sweet nonetheless. Scores were level with only minutes to play but Collingwood somehow summoned the strength to pull away at the last second. A lucky 50m penalty to Fasolo brought him within 40m from goal. Moments later, Pendlebury finished off the game in style with a goal from the centre square that appeared destined to bounce through for a behind. The scene was set when Collingwood kicked eight goals to two in the opening quarter. There were shades of the 2010 Preliminary Final in the way the Magpies were kicking their goals but the highlight of the night was undoubtedly Tarrant’s two goals in his return to the forward line. Maxwell kicked his first goal since early 2009 and Thomas’ three goals and 15 possessions helped take the game right out of Geelong’s reach.